Baby blue hooded towel with embroidered name and stars embroidery. 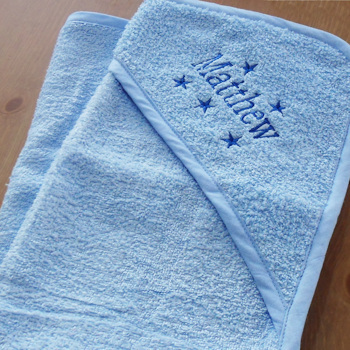 Baby blue hooded towel with embroidered name and stars embroidery. Soft cuddle robe made from 100% terry cotton measuring approximately 75cm by 75cm to dry baby after bath time. This hooded towel will make an unique gift for babies. This hooded towel will make an unique gift for babies. Just fill in a name for us to embroider and choose a letter font style. Small scatter stars are sewn around the name making a cute personalised gift.